We love the book Pat the Bunny at our house. We had a birthday party to go to for a cute little one year old and I thought it would be fun to give him this little book with a little something handmade to go with it. So I whipped up a little Bunny Puppet for his older siblings to show to him and play. I like how it turned out so much that I thought I'd share the pattern with you all! 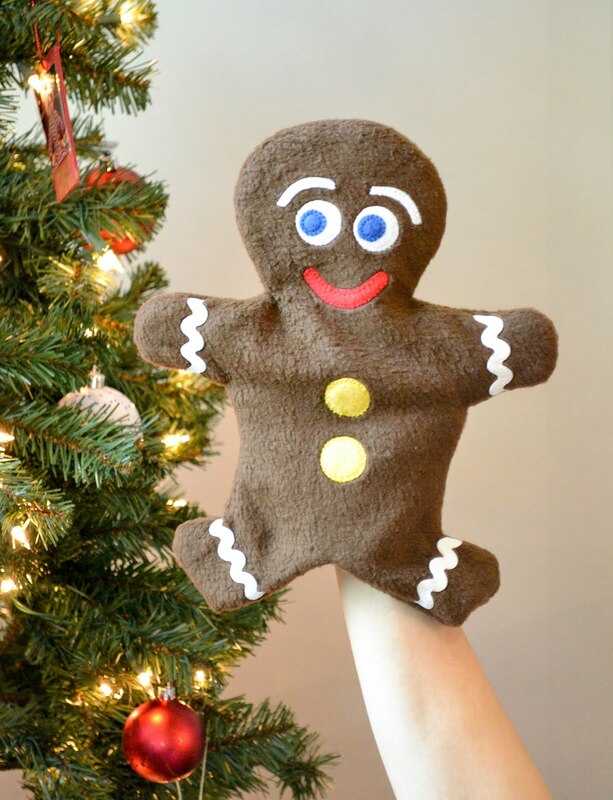 This project is so easy it would be a great one for a child to make who is learning how to sew. 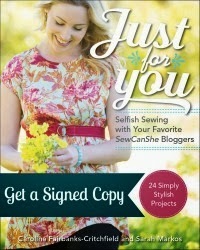 There is a little handsewing, machine sewing along a line, and fabric cutting practice. When they are finished the'll have a little toy to play with for their younger sibling or they can put on a puppet show. It would also make a fun quick Christmas gift. 1/4 yard of white felt or polar fleece 2 sheets of felt will work but the felt sold on the bolt is much thicker and nicer. You can even splurge for wool felt which will hold up nicely and not get pills as it wears. Polar fleece will make a bunny with more floppy ears. Be sure to cut out the pattern with the stretch of the fleece going around the bunny's tummy. 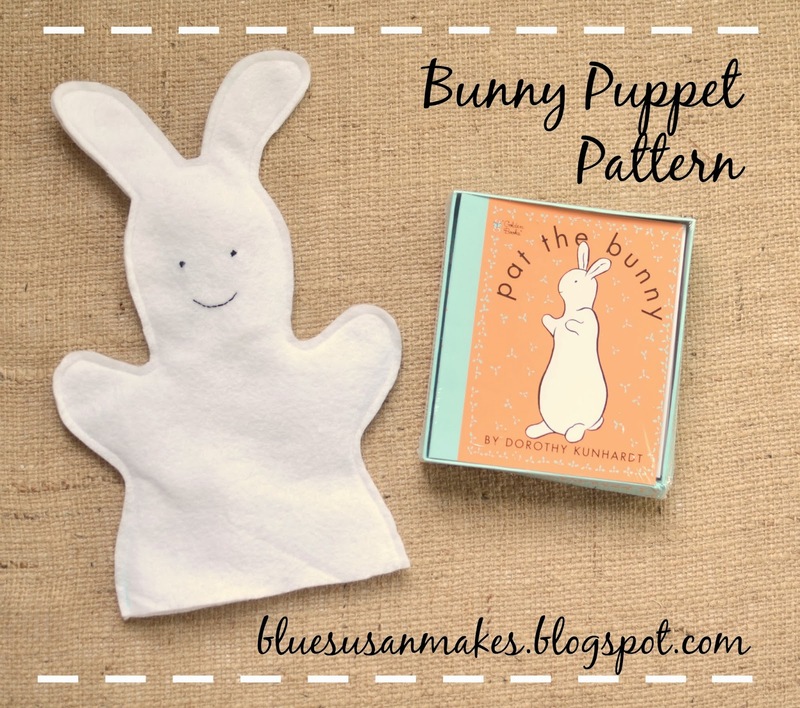 Print the Bunny Puppet Pattern clicking on the link should take you to a free PDF. 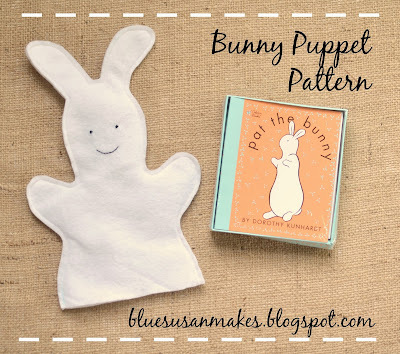 First, trace around the Bunny Puppet Pattern onto a piece of felt or polar fleece using a water soluble marker. Transfer the markings for the eyes and mouth and be sure to stitch along them with a few strands of embroidery floss before you sew the puppet together. Oops, I waited until the end to sew the face which was trickier than it needed to be. Stack your felt piece on top of another piece of felt that is about the same size and sew along the traced line. 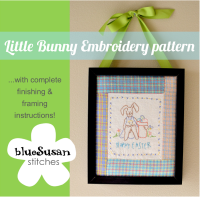 Be sure to backstitch at the beginning and end. Using a pair of sharp scissors ,trim around the stitching leaving about 1/4 inch seam allowance. Rub away the marking pen using a Q-tip dipped in water. I let my kids do this part for fun. It is like magic how easily the pen fades away. There you have it! Quick and easy right?